Use the data that the internet provides to strengthen and advance your brand and your products. 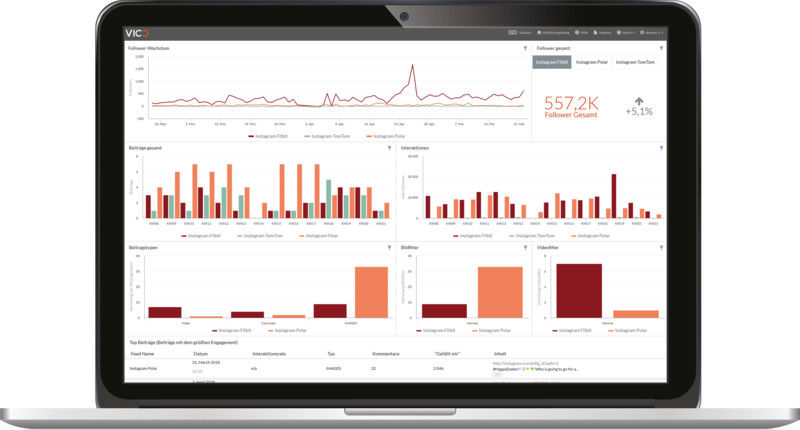 Our social media monitoring suite, VICO Analytics, gives you wide-ranging possibilities to monitor communication and insights into your company and products, as well as analysing them at any time via an easy-to-use dashboard. 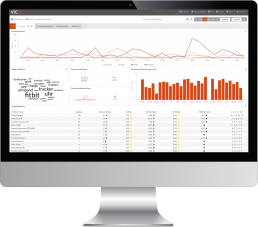 VICO Analytics makes it possible to analyse your products as well as rival ones in real time. We extract relevant information from the social web using highly developed technologies and our own expertise, and integrate this information into your business procedures. Choose your preferred display format from over 5000 visualisation possibilities and mix-and-match charts. 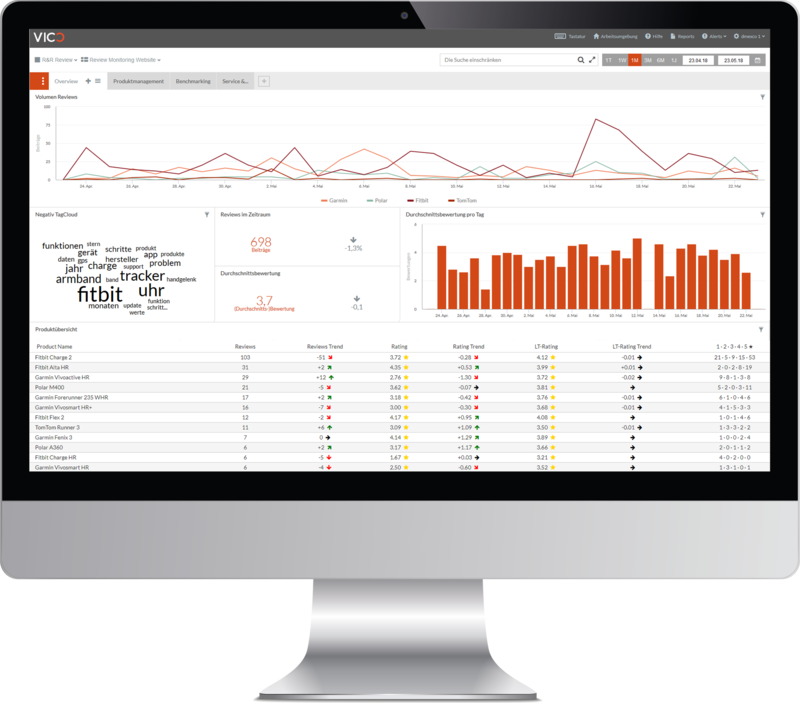 Our dashboard is a team player and provides a range of possibilities for collaboration. Over 50 filter possibilities and a drill-down option for every chart make it possible to compile the desired information quickly and simply. Our AI and machine-learning technologies are highly developed and are constantly upgraded in order to provide you with the best results. 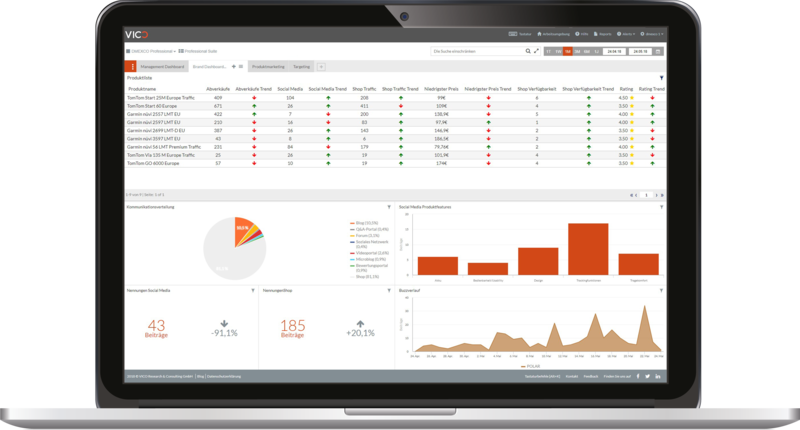 Free report and alert options plus freely selectable cycles and triggering criteria afford you individuality tailored to your requirements. Our consulting and language team will assist you with complex and highly accurate alerts. Many hundreds of millions of data sources crossing national borders and language barriers, but you still can’t find the source you want? Not a problem, we will gladly expand our portfolio for you. Due to our servers in Germany and an ISO 27001 certification we guarantee our customers the highest data protection requirements. 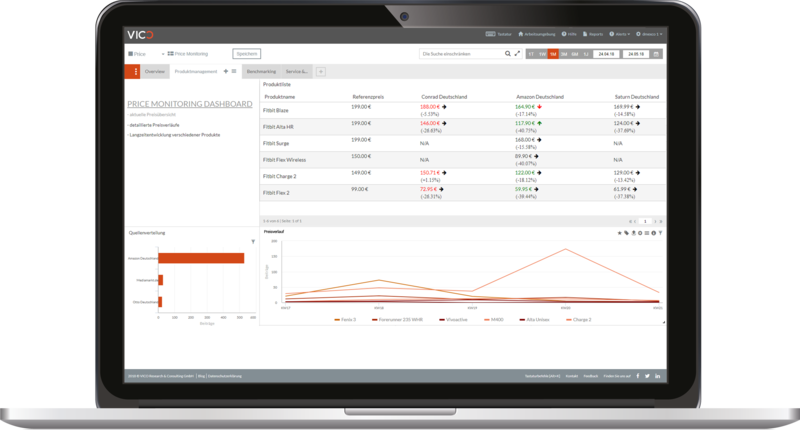 Combine your Analytics data with your internal company data thanks to our open interfaces. 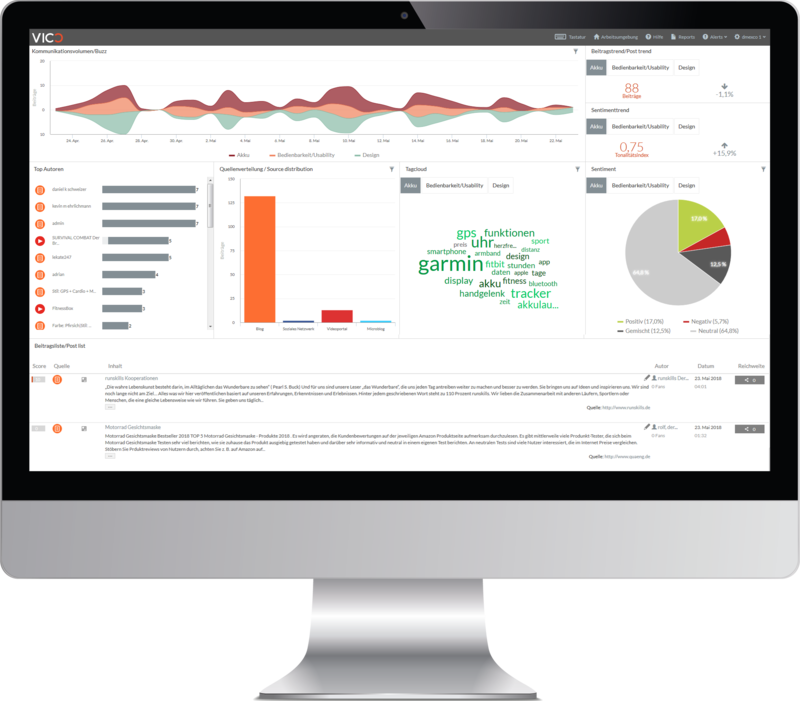 Social metrics help to measure, analyse and optimise performance in social media – along with your own channel, also benchmarking with competitors and topics. Through social media analyses and with the aid of social metrics, companies maintain an overview in the struggle for users’ time and attention, whether on social media channels like Twitter, Facebook, Instagram, YouTube, Pinterest, or the next big thing that we don’t yet know anything about. The answers to “What moves our target group?”, “What is relevant for users?”, “How does my content work?” and “Is the campaign going to be a success?” lie in the KPIs and key figures delivered by social metrics. Nowadays, users do not wait long for a reaction from companies, and especially not when something has gone wrong. Today more than ever before, companies rely on their brands, products and service being well-received on rating platforms, in app stores, online shops like Amazon, and in social media discussions. Review monitoring with an automatic sentiment analysis provides an overview of the response to your own brands, products and services, but also to those of your competitors – on national and international online shops, rating platforms, as well as sites where users vent their frustrations. make the consumer’s life easier and thereby gain relevance. Observe important insights in price development, and increase your profits through exact price analyses. Providing an app to users is not necessarily a simple thing. When something is going wrong, users are leaving negative ratings, or the update isn’t providing the desired results, it is essential to be informed. Similarly to review monitoring, app monitoring ensures that you can always keep an eye on app reviews on iTunes and Google Play. does it become possible to quickly ensure that the app fulfils its desired objective. 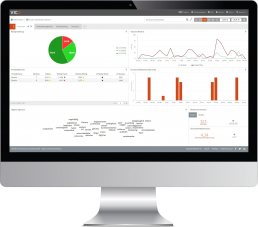 Our product information system (PRISY) offers all the advantages of VICO’s entire monitoring suite. In the digital world, linear customer journeys are outdated. Search engines, social advertising, banners, product reviews, Amazon, one-click shopping, etc… There are plenty of buzzwords, but consumers have even more individual options. What was hype yesterday is already old news today. Only by combining all the data on just one platform in near real time, marketing and sales decisions as well as the right communication can be adjusted “in the right place, at the right time, to the right person, with the right content” (sorry to all those who are fed up of hearing this mantra). In our words: Welcome to the world of VICO PRISY. 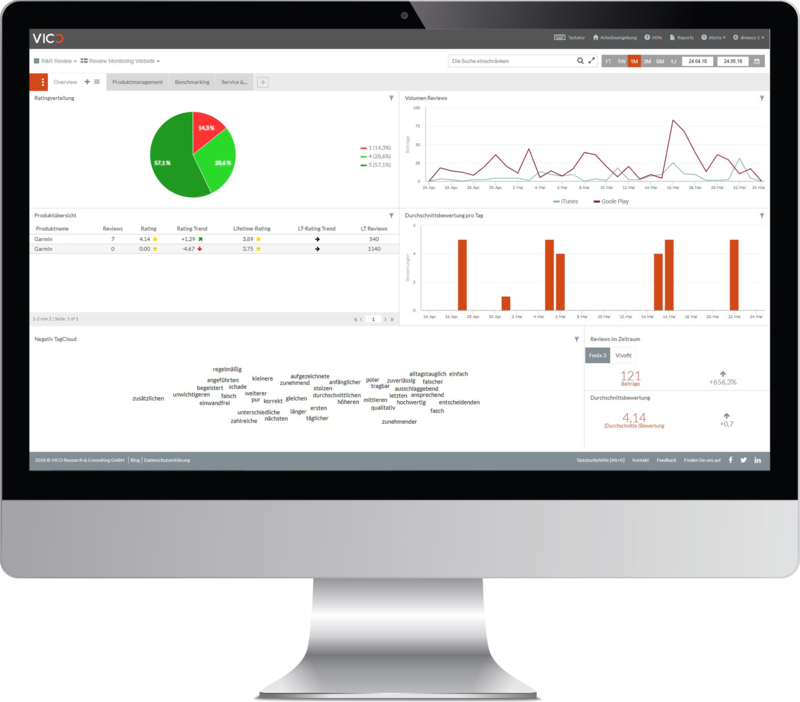 The tool for the right decisions – guided by key figures and product information such as sales rates, shop availability of products, product reviews, price information and price changes, visitor data and, of course – considering all of VICO – data from social media listening / monitoring and social metrics.